In the 1990s, there were three wrestlers (dubbed the 3 Musketeers by some wrestling columnists) who dominated New Japan Pro Wrestling: Masa Chono, Keiji Mutoh, and Shinya Hashimoto. To be listed in the company of two other legends displays Hashimoto's contribution to the sport. Hashimoto grew up in Toki City, and began training in judo in his late teens. His training helped him in his transition to professional wrestling, as he joined New Japan Pro Wrestling in April 1984. Hashimoto worked on becoming a skilled wrestler over the next few years, travelling whenever necessary to gain more seasoning. Over time, Hashimoto began to grow respected in the eyes of the Japanese fans, leading to his climb up the NJPW ladder. In Setpember 1989, Hashimoto teamed with Masa Saito to win his first gold, the NJPW IWGP Tag-Team Titles, beating Riki Choshu & Takayuki Iizuka. The two would hold the belts until the next year, losing in April 1990 to two other up-and-comers: Masa Chono & Keiji Mutoh. For the next few years, Hashimoto built his reputation in NJPW, taking on all comers, including kickboxers and other professional fighters. Hashimoto hit the big time in 1993, as he won the IWGP Heavyweight Title from the Great Muta (aka Keiji Mutoh) in September. Hashimoto would hold the biggest belt in NJPW for the next 7 months before being taken down by the legendary Tatsumi Fujinami. However, Hashimoto didn't sit back after the defeat, as he regained the gold only a month later, in May 1994. For the next year, Hashimoto stayed the force in New Japan, defeating challenger after challenger. In fact, Hashimoto reigned as the IWGP Champion for almost exactly a year, losing the belt to Mutoh only a few days after celebrating the milestone. A few months after losing the gold, Hashimoto teamed up with Junji Hirata in July 1995 to face and defeat Scott Norton & Mike Enos to win the vacated NJPW IWGP Tag-Team Titles, making Hashimoto a two-time champion in both divisions. This led to Hashimoto going on another long-championship run, as he & Hirata would remain the champions for almost another year. Hashimoto also became a double champion, as he defeated Nobuhiko Takada to regain the IWGP Heavyweight Title in April 1996. Hashimoto & Hirata would lose the tag titles in June 1996, when they fell to Kazuo Yamazaki & Takashi Iizuka. This allowed Hashimoto to focus on the singles gold, as he worked on another long run. Through the end of 1996 and a good portion of 1997, Hashimoto could not be stopped. Finally, at the end of August 1997, Hashimoto lost the Heavyweight Title to Kensuke Sasaki, ending a historic run. Hashimoto continued to work for NJPW for the next few years, earning another great honor by winning the G-1 Climax in 1998. However, the gold no longer came easily for the long-time champion, and after several losses to his rival, Naoya Ogawa, Hashimoto vowed to retire if he lost again to the judo star. Unfortunately, Hashimoto did lose, and in April 2000, Hashimoto left NJPW behind, disappearing for a time from the wrestling scene. It turned out, though, that Hashimoto had other plans than retirement, as he founded Zero-One in March 2001. This was a major accomplishment, as Hashimoto helped the organization become a force in Japan. Hashimoto also showed that his wrestling talents had not diminished, as he challenged Steve Corino for the NWA World Heavyweight Championship in October 2001. The match ended in controversy, leading to the belt being held up. In December 2001, Hashimoto faced off against Corino and Gary Steele in a "Triple Threat" Match, winning the vacated NWA World Heavyweight Title, another prestigious honor for the Japanese legend. Hashimoto's NWA World Title reign would come to an end in March 2002, through duplicitous means, as a crooked referee gave a fast count, allowing Dan Severn to win away the belt. Hashimoto then went back to concentrating on Zero-One, where he was an active competitor. In October 2002, Hashimoto teamed with his old rival, Naoya Ogawa, to win the NWA Intercontinental Tag-Team Titles (which were usually defended in Zero One) from John Heidenreich & Nathan Jones. The two would defend the belts for the next few months, before falling to Matt Ghaffari & Tom Howard in December 2002. The two teams feuded on and off over the next few months, even as Hashimoto looked to another organization for a major accomplishment. In February 2003, Hashimoto defeated the Great Muta (Mutoh) to earn the All Japan Pro Wrestling Triple Crown Heavyweight Title. This was a major success, as Hashimoto became only the second man to have held the NJPW, AJPW, and NWA World Titles (Mutoh was the first). Hashimoto added to that gold, temporarily, when he & Ogata won back the NWA Intercontinental Tag-Team Titles from Ghaffari & Howard in April 2003. However, due to Ogaya having thrown Ghaffari over the top rope at one point in the match, NWA President Richard Arpin stripped them of the belts a few days later (throwing an opponent over the top rope is against the rules in the NWA). Hashimoto's AJPW Triple Crown would face a similar fate, as Hashimoto suffered a knee injury in August 2003 and had to vacate the belt. Despite the build-up of several injuries, Hashimoto continued to wrestle on and off in Zero-One, including teaming with Yoshaki Fujiwara to get the NWA Intercontinental Tag-Team Titles for a third time, defeating Takao Omori & Shiro Koshinaka in June 2004. The two would stay the champs for the next few months, before Omori found a new partner in Shinjiro Ohtani to take the belts away in August 2004. Going into 2005, Hashimoto surprisingly left Zero-One, placing Ohtani in charge. Many speculated that, once Hashimoto recovered from various injuries, he would be making a return to New Japan Pro Wrestling. Unfortuntely, this would not be the case. 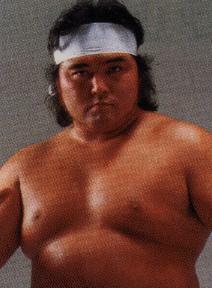 One July 11th, 2005, Hashimoto suffered a brain hemorrhage and collapsed, passing away at the age of 40. It was a shocking death to long-term fans of the star, who seemed too young to die in such a way. Hashimoto's effects on professional wrestling in Japan cannot be understated, as he took several companies, from NJPW to Zero-One, to great heights, becoming a true legend in the sport. - NJPW Sumo Hall (April 18, '85) = Hashimoto & Shuko Kim were beaten by Keiji Mutoh & Mokoto Arakawa. - NJPW Sumo Hall (February 6, '86) = Hashimoto defeated Akira Nogami. - NJPW Sumo Hall (October 9, '86) = In a dark match, Hashimoto forced Masaharo Funaki to submit. - NJPW Sumo Hall (December 11, '86) = Hashimoto was pinned by Tatsutoshi Goto. - NJPW Sumo Hall (February 5, '87) = Hashimoto & Chris Benoit lost to Tatsutoshi Goto & Naoki Sano. - NJPW Inoki Toukon Live II (March 26, '87) = Hashimoto fell to Tatsutoshi Goto. - NJPW Sumo Hall (April 27, '87) = Hashimoto was taken down by Kazuo Yamazaki. - NJPW Sumo Hall (August 2, '87) = Hashimoto & Osamu Matsuda were beaten by Tatsuo Nakano & Yoji Antoh. - NJPW Sumo Hall (August 19, '87) = Hashimoto was forced to submit to Don Arakawa. - NJPW Sumo Hall (August 20, '87) = Hashimoto & Don Arakawa won, via DQ, over Shunji Kosugi & the Black Cat. - NJPW Sumo Hall (October 25, '87) = Hashimoto & Tatsutoshi Goto defeated Darryl Peterson & Steve Casey. - NJPW Japan Cup Six Man Elimination Tag Team League '88 (November/December) = Hashimoto, Masa Chono & Tatsumi Fujinami lost to Riki Choshu, Antonio Inoki & Kantaro Hoshino in the finals. - NJPW Egg Dome (April 24, '89) = Hashimoto beat Riki Choshu. Later on, Hashimoto forced Victor Zangiev to submit. Finally, Hashimoto lost to Big Van Vader, who earned the vacated IWGP Title. - NJPW Sumo Hall (August 10, '89) = Hashimoto was pinned by Salmon Hashimikov. - NJPW World Cup Tournament (November/December '89) = Hashimoto beat Salman Hashimikov and Steve Williams to reach the finals. - NJPW Sumo Hall (December 7, '89) = Hashimoto lost in the finals of the World Cup Tournament to Riki Choshu. - NJPW New Japan in U.S.S.R. (December 31, '89) = Hashimoto fought to a Draw with Wahka Eveloev. - NJPW Egg Dome (February 10, '90) = Hashimoto & Masa Chono were beaten by Antonio Inoki & Seiji Sakaguchi. - AJPW Egg Dome (April 13, '90) = Hashimoto & Masa Saito retained the IWGP Tag Titles, winning over Masa Chono & Riki Choshu. - NJPW Sumo Hall (June 26, '90) = Hashimoto & Masa Saito fell to the IWGP Tag Champs, Masa Chono & Keiji Mutoh. - NJPW Sumo Hall (August 19, '90) = Hashimoto & Masa Saito defeated Bam Bam Bigelow & the Soultaker. - NJPW Inoki's 30th Wrestling Anniversary (September 30, '90) = Hashimoto won, via countout, over Bam Bam Bigelow. - NJPW Budokan Hall (November 1, '90) = Hashimoto lost to the IWGP Champ, Riki Choshu. - NJPW Legends Show (December 26, '90) = Hashimoto lost a "Wrestler Vs. Boxer" Match to Tony Halme. - NJPW Budokan Hall (June 12, '91) = Hashimoto won a "Wrestler vs. Boxer" Match over an unknown opponent. - NJPW Sumo Hall (August 9, '91) = Hashimoto fought to a Draw with Masa Chono. - NJPW Sumo Hall (August 10, '91) = Hashimoto beat Riki Choshu. - NJPW Sumo Hall (August 11, '91) = Hashimoto fell to Masa Chono in the G-1 Climax League '91. - NJPW Super Grade Tag League (October '91) = Hashimoto & Scott Norton competed in the league, which was won by Tatsumi Fujinami & Big Van Vader. - NJPW Budokan Hall (November 5, '91) = Hashimoto lost to the Greatest 18 Club Champ, Riki Choshu. - NJPW Egg Dome (January 4, '92) = Hashimoto took down Bill Kazmeier. - NJPW 20th Anniversary Show (March 1, '92) = Hashimoto pinned Riki Choshu. - NJPW Sumo Hall (April 30, '92) = Hashimoto & Riki Choshu defeated Scott Norton & Tony Halme. - WCW Great American Bash '92 (July 12) = Hashimoto & Hiro Hase beat the Freebirds, then lost to Dustin Rhodes & Barry Windham. Terry Gordy & Steve Williams went on to win the vacated NWA Tag Titles. - NJPW G-1 Climax '92 (August) = Hashimoto defeated the Barbarian, then fell to Rick Rude. Masa Chono won the tournament. - NJPW Sumo Hall (August 11, '92) = Hashimoto & Osamu Kido lost to Kengo Kimura & Shiro Koshinaka. - NJPW Super Grade Tag League II (October '92) = Hashimoto & Riki Choshu beat Hiro Hase & Kensuke Sasaki in the finals to win the league. - NJPW Sumo Hall (November 22, '92) = Hashimoto defeated TNT. - NJPW Sumo Hall (November 23, '92) = Hashimoto & Akira Nogami lost to Keiji Mutoh & Tatsumi Fujinami. - NJPW Egg Dome (January 4, '93) = Hashimoto & Masa Saito took down Scott Norton & Dustin Rhodes. - NJPW Sumo Hall (February 16, '93) = Hashimoto, Masa Chono & Keiji Mutoh lost to Kengo Kimura, Shiro Koshinaka & the Great Kabuki. - WAR Sumo Hall (April 2, '93) = Hashimoto & Riki Choshu beat Genichiro Tenryu & Isao Takagi. - NJPW Fukuoka Dome (May 3, '93) = Hashimoto & Masa Chono lost to the IWGP Tag Champs, the Hellraisers. - NJPW Budokan Hall (June 15, '93) = Hashimoto, Hiroshi Hase, Masa Chono, Riki Choshu & Tatsumi Fujinami fought in an "Elimination" Match against Genichiro Tenryu, Tatsutoshi Goto, Ashura Hara, Takashi Ishikawa & Super Strong Machine. Hashimoto, Chono & Choshu "survived". - NJPW Budokan Hall (June 17, '93) = Hashimoto fell to Genichiro Tenryu. - NJPW Sumo Hall (August 2, '93) = Hashimoto, Masa Chono & Tatsumi Fujinami were beaten by Genichiro Tenryu, Ashura Hara & Takashi Ishizawa. - NJPW G-1 Climax '93 (August '93) = Hashimoto lost in the first round to Hiro Hase. Tatsumi Fujinami won the tournament. - NJPW Sumo Hall (August 8, '93) = Hashimoto lost to Genichiro Tenryu. - NJPW Battlefield Yokohama (September 23, '93) = Hashimoto retained the IWGP Heavyweight Title, beating Jake Roberts. - NJPW Super Grade Tag League III (October/November '93) = Hashimoto & Masa Chono competed in the league, which was won by Keiji Mutoh & Hiro Hase. - NJPW Sumo Hall (November 4, '93) = Hashimoto & Masa Chono were beaten by Keiji Mutoh & Hiroshi Hase. - NJPW Egg Dome (January 4, '94) = Hashimoto stayed the IWGP Champ, taking down Masa Chono. - NJPW Sumo Hall (February 17, '94) = Hashimoto pinned Genichiro Tenryu. - NJPW Budokan Hall (February 24, '94) = Hashimoto pinned Jushin Liger. - NJPW Fukuoka Dome (May 4, '94) = Hashimoto won the IWGP Championship, taking down Tatsumi Fujinami. - NJPW Budokan Hall (June 15, '94) = Hashimoto kept the IWGP Title, winning over Riki Choshu. - NJPW G-1 Climax '94 (August) = Hashimoto competed in the league, which was won by Masa Chono. - NJPW Sumo Hall (August 3, '94) = Hashimoto was beaten by Hiroshi Hase. - NJPW Sumo Hall (August 4, '94) = Hashimoto defeated Takayuki Iizuka. - NJPW Sumo Hall (August 5, '94) = Hashimoto fought to a Draw with Power Warrior. - NJPW Sumo Hall (August 6, '94) = Hashimoto took down Tatsumi Fujinami. - NJPW Sumo Hall (August 7, '94) = Hashimoto fought to a Draw with Shiro Koshinaka. - NJPW Super Grade Tag League IV (October '94) = Hashimoto & Manabu Nakanishi competed in the league, which was won by Keiji Mutoh & Hiro Hase. - NJPW Sumo Hall (October 30, '94) = Hashimoto & Manabu Nakanishi beat Akira Nogami & Takayuki Iizuka. - NJPW Egg Dome (January 4, '95) = Hashimoto retained the IWGP Title, winning over Kensuke Sasaki. - NJPW Sumo Hall (February 19, '95) = Hashimoto kept the IWGP Championship, forcing Scott Norton to submit. - NJPW Weekly Pro (April 2, '95) = Hashimoto held onto the IWGP Title, pinning Masa Chono. - WCW Kollision in Korea/Pyongyang Sports Festival (April 28, '95) = Hashimoto stayed the IWGP Champ, fighting to a Draw with Scott Norton. - NJPW Fukuoka Dome (May 3, '95) = Hashimoto lost the IWGP Title to Keiji Mutoh. - NJPW Budokan Hall (June 14, '95) = Hashimoto beat Manabu Nakanishi. - NJPW Sumo Hall (August 11, '95) = Hashimoto defeated Scott Norton. - NJPW Sumo Hall (August 12, '95) = Hashimoto was pinned by Kensuke Sasaki. - NJPW Sumo Hall (August 13, '95) = Hashimoto beat Hiroyoshi Tenzan. - NJPW G-1 Climax '95 (August) = Hashimoto won over Masa Chono, then fell to Keiji Mutoh in the finals. - NJPW Egg Dome (October 9, '95) = Hashimoto forced Tatsuo Nakano to submit. - NJPW Super Grade Tag League V (October '95) = Hashimoto & Junji Hirata lost in the semi-finals to the eventual winners, Masa Chono & Hiroyoshi Tenzan. - NJPW Sumo Hall (November 19, '95) = Hashimoto & Tadao Yasuda were beaten by Arn Anderson & the Giant. - NJPW Egg Dome (January 4, '96) = Hashimoto pinned Kazuo Yamazaki. - NJPW Sumo Hall (April 25, '96) = Hashimoto & Super Strong Machine stayed the IWGP Tag Champs, beating Yoji Antoh & Yoshihiro Takayama. - NJPW Egg Dome (April 29, '96) = Hashimoto won the IWGP Title from Nobuhiko Takada. - NJPW Rikidozan Memorial Show '96 (June 30) = Hashimoto & Junji Hirata lost to Keiji Mutoh & Kensuke Sasaki. - NJPW Sumo Hall (August 2, '96) = Hashimoto fell to Riki Choshu. - NJPW Sumo Hall (August 4, '96) = Hashimoto was beaten by Hiroyoshi Tenzan. - NJPW Sumo Hall (August 5, '96) = Hashimoto & Satoshi Kojima defeated Akitoshi Saito & Michiyoshi Ohara. - NJPW Sumo Hall (August 6, '96) = Hashimoto lost to Kensuke Sasaki. - NJPW G-1 Climax '96 (August) = Hashimoto competed in the league, which was won by Riki Choshu. - UWFI Jingu Stadium (September 11, '96) = Hashimoto pinned Yuki Sano. - NJPW Japan/US All-Star Tournament (September '96) = Hashimoto defeated Marcus Bagwell and Steve Regal, then lost to Shiro Koshinaka. Kensuke Sasaki won the tournament. - NJPW Super Grade Tag League VI (October/November '96) = Hashimoto & Scott Norton beat Keiji Mutoh & Rick Steiner to win the league. - NJPW Egg Dome (January 4, '97) = Hashimoto defeated Riki Choshu to keep the IWGP Championship. - NJPW Sumo Hall (February 16, '97) = Hashimoto stayed the IWGP Champ, beating Kazuo Yamazaki. - NJPW Egg Dome (April 12, '97) = Hashimoto lost to Naoya Ogawa. - NJPW Osaka Dome (May 3, '97) = Hashimoto retained the IWGP Championship, forcing Naoya Ogawa to submit. - NJPW Budokan Hall (June 5, '97) = Hashimoto kept the IWGP Title, beating Keiji Mutoh. - NJPW G-1 Climax '97 (August) = Hashimoto won over Kazuo Yamazaki and Masa Chono, then lost to Hiroyoshi Tenzan. Kensuke Sasaki won the tournament. - NJPW Nagoya Dome (August 10, '97) = Hashimoto stayed the IWGP Champ, winning over Hiroyoshi Tenzan. - NJPW Three Gun Tag Team Tournament (September '97) = Hashimoto & Tadao Yasuda defeated Michiyoshi Ohara & Tatsutoshi Goto and Manabu Nakanishi & Satoshi Kojima, then lost to the eventual winners, Kensuke Sasaki & Kensuke Yamazaki. - NJPW Budokan Hall (September 23, '97) = Hashimoto forced Zane Frasier to submit. - NJPW Fukuoka Dome (November 2, '97) = Hashimoto forced Hubert Numrich to submit. - NJPW Super Grade Tag League VII (November/December '97) = Hashimoto & Manabu Nakanishi beat Kazuo Yamazaki & Kensuke Sasaki, then lost in the finals to Keiji Mutoh & Masa Chono. - NJPW Egg Dome (January 4, '98) = Hashimoto forced Dennis Lane to submit. - NJPW Budokan Hall (February 15, '98) = Hashimoto pinned Big Titan. - NJPW Egg Dome (April 4, '98) = Hashimoto & Osamu Nishimura lost to the IWGP Tag Champs, Keiji Mutoh & Masa Chono. - NJPW Budokan Hall (June 5, '98) = Hashimoto was forced to submit to the IWGP Champ, Tatsumi Fujinami. - NJPW G-1 Climax '98 (July/August) = Hashimoto defeated Tatsutoshi Goto, Genichiro Tenryu, Satoshi Kojima and Kazuo Yamazaki to win the tournament. - NJPW Osaka Dome (August 8, '98) = Hashimoto lost to the J-1 Japanese Champion, Genichiro Tenryu. - NJPW WCW Tag Title Contenders League (September '98) = Hashimoto & Kazuo Yamazaki lost in the finals to Yuji Nagata & Kensuke Sasaki. - NJPW Super Grade Tag League VIII (November/December '98) = Hashimoto & Tatsumi Fujinami won over Kazuo Yamazaki & Kensuke Sasaki, then lost in the finals to Keiji Mutoh & Satoshi Kojima. - NJPW Egg Dome (January 4, '99) = Hashimoto fought to a No-Contest with Naoya Ogawa. - NJPW Budokan Hall (June 8, '99) = Hashimoto was pinned by Genichiro Tenryu. - NJPW Sumo Hall (August 13, '99) = Hashimoto defeated Kazuo Yamazaki. - NJPW Sumo Hall (August 14, '99) = Hashimoto was forced to submit to Shiro Koshinaka. - NJPW Sumo Hall (August 15, '99) = Hashimoto lost to Manabu Nakanishi. - NJPW G-1 Climax '99 (August) = Hashimoto competed in the league, which was won by Manabu Nakanishi. - NJPW Battle of Last Summer (August 28, '99) = Hashimoto fell to Masa Chono. - NJPW G-1 Climax Tag Team League '99 (September) = Hashimoto & Meng competed in the tournament, which was won by Keiji Mutoh & Scott Norton. - NJPW Budokan Hall (September 23, '99) = Hashimoto & Meng won over Tatsumi Fujinami & Shiro Koshinaka. - NJPW Egg Dome (October 11, '99) = Hashimoto fell to the NWA World Champion, Naoya Ogawa. Tatsumi Fujinami was the special referee. - NJPW Egg Dome (January 4, '00) = Hashimoto & Takashi Iizuka won over Naoya Ogawa & Kazunari Murakami. - NJPW Sumo Hall (February 20, '00) = Hashimoto pinned Scott Norton. - NJPW Rikidozan Memorial '00 (March 11) = Hashimoto & Naoya Ogawa were beaten by Genichiro Tenryu & B.B. Jones. - NJPW Egg Dome (April 7, '00) = Hashimoto was KO'ed by Naoya Ogawa. - NJPW Egg Dome (October 9, '00) = Hashimoto forced Tatsumi Fujinami to submit. - NOAH Great Voyage (December 23, '00) = Hashimoto pinned Takao Omori. - Inoki's Bom-Ba-Ya '00 (December 31) = Hashimoto forced Gary Goodridge to submit. - NJPW Egg Dome (January 4, '01) = Hashimoto fought to a No-Contest with Riki Choshu. - Zero-One Sumo Hall (March 2, '01) = Hashimoto & Yuji Nagata fell to Mitsu Misawa & Jun Akiyama. - NJPW Osaka Dome (April 9, '01) = Hashimoto won a "No Rules" Match over Kensuke Sasaki. - Zero-One Budokan Hall (April 18, '01) = Hashimoto & Tadao Yasuda defeated Masao Inoue & Tamon Honda. - Zero-One Castle Hall (June 14, '01) = Hashimoto forced Tom Howard to submit. - Zero-One Budokan Hall (August 30, '01) = Hashimoto & Yoshiaki Fujiwara beat Mark Kerr & the Predator. - NWA 53rd Anniversary Show (October 13, '01) = Hashimoto fought to a No-Contest with NWA World Champion, Steve Corino. - Zero-One Budokan Hall (October 25, '01) = Hashimoto forced Gerard Gordeau to submit. - Zero-One Castle Hall (December 9, '01) = Hashimoto & Naoya Ogawa defeated Tom Howard & Mark Kerr. - Zero-One Sumo Hall (March 2, '02) = Hashimoto took down Masato Tanaka. - NJPW Egg Dome (May 2, '02) = Hashimoto & Naoya Ogawa beat Scott Norton & Hiroyoshi Tenzan. - Zero-One Matsuyama Community Center (May 3, '02) = Hashimoto & Naoya Ogawa fought to a No-Contest with Tom Howard & the Predator. - Zero-One Sumo Hall (July 7, '02) = Hashimoto forced Kazuhiko Ogasawara to submit. - AJPW Wrestle-1 '02 (November 17) = Hashimoto forced Josh Dempsey to submit. - Zero-One Sumo Hall (December 15, '02) = Hashimoto & Naoya Ogawa lost the NWA Intercontinental Tag Titles to Tom Howard & Matt Ghaffari. - Zero-One Korakuen Hall (January 5, '03) = Hashif Khan beat Al Katrazz. - AJPW Prefectural Gym (January 13, '03) = Hashimoto & Kazuhiko Ogasawara beat Satoshi Kojima & Kendo Ka Shin. - AJPW Wrestle-1 '03 (January 19) = Hashimoto forced Joe Son to submit. - AJPW Budokan Hall (February 23, '03) = Hashimoto won the AJPW Triple Crown Title from Keiji Mutoh. - Zero-One Sumo Hall (March 2, '03) = Hashimoto & Shinjiro Ohtani defeated Keiji Mutoh & Arashi. - AJPW Budokan Hall (April 12, '03) = Hashimoto stayed the AJPW Triple Crown Champ, beating Arashi. - Zero-One Sumo Hall (July 6, '03) = Hashimoto & Naoya Ogawa took down Keiji Mutoh & Toshiaki Kawada. - Zero-One Sumo Hall (December 14, '03) = Hashimoto, Osamu Namiguchi, Hirotaka Yokoi, Shinsuke Yamagasa, Kohei Sato, Yoshito Sasaki & Tatsuhito Takaiwa won a "Gang War" Match over Riki Choshu, Takashi Uwano, Ichiro Yaguchi & Tomohiro Ishii. - Zero-One Hustle I (January 4, '04) = Hashimoto won, via countout, over Vader. - AJPW Budokan Hall (February 22, '04) = Hashimoto lost to the AJPW Unified Triple Crown Champion, Toshiaki Kawada. - Zero-One Third Anniversary Show (February 29, '04) = Hashimoto pinned Riki Choshu. - Zero-One Hustle II (March 7, '04) = Hashimoto & Toshiaki Kawada fell to Mark Coleman & Kevin Randleman. - Zero-One Hustle III (May 8, '04) = Hashimoto & Naoya Ogawa defeated the Outsiders. - Zero-One Hustle IV (July 25, '04) = Hashimoto forced Gama King to submit.